Unlike the 47MP variant on the S1R, which was announced at the same time, the S1 features a 24MP CMOS sensor. Paired with a new VENUS processor, the stabilized 24MP CMOS sensor in the S1 delivers a high native ISO range up to 51,200; bursts at up to 9 fps in AFS mode; and 6 fps with continuous AF. Typical of stabilized sensors, the S1 also has a multi-shot high-resolution capability that allows the creation of 96MP images. Panasonic has built the camera with a sealed magnesium alloy body, a durable shutter that’s capable of 400K shutter actuations, and a high 1/320 sec flash synchronization. It also has an electronic viewfinder with a 5.76 million-dot OLED-type display, and adjustable magnification from 0.7 to 0.78x. At the rear, the S1 has a 3.2-inch touchscreen monitor that can both tilt and flip. As befitting a pro-oriented model, the new camera has two media card slots, one for XQD and a second that records to SD UHS-II media cards. 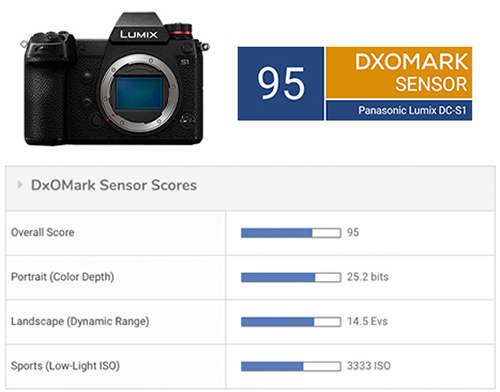 The Panasonic S1’s 24MP full-frame CMOS sensor achieves a high overall DxOMark score of 95, which is the 12th-highest place overall among all of the cameras in our database. Although it’s an excellent all-round performer, its key strength is its (Portrait) color depth, and its score of 25.2 bits is the second-best result (by just 0.1 bit) we’ve seen for a full-frame sensor at this resolution. At 14.5 EV, the S1’s (Landscape) dynamic range score is also impressively high, and only 0.2 EV behind the best in class for this pixel count (the Sony A7 III). While some higher-resolution full-frame sensors can achieve slightly better color sensitivity and dynamic range scores, the S1’s excellent scores in these areas, in conjunction with lower pixel density (and therefore larger pixels) in this 24MP sensor, translates into an excellent Low-light ISO (Sports) score of ISO 3333. 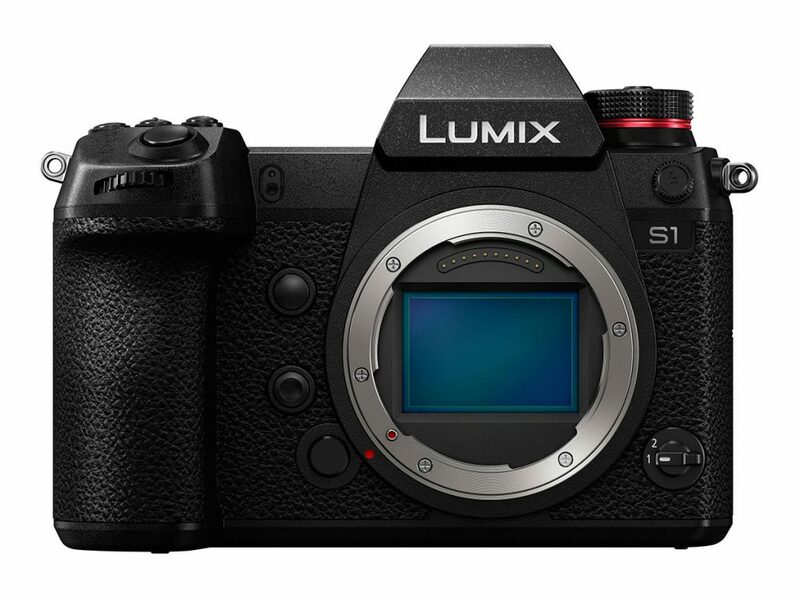 Combining low noise, excellent color sensitivity, and a wide dynamic range with a sufficiently high pixel count for many publishing tasks, the Panasonic Lumix S1 looks promising for a wide range of photographic genres. For its first foray into full-frame cameras, Panasonic has selected a CMOS sensor with the same 24MP resolution as that used by both the Sony A7 III and the Nikon Z 6. With just one point between them in the DxOMark rankings and similar Portrait, Landscape, and Sports scores, the new Lumix DC-S1 sensor performs practically identically to its most direct competitors. The 24MP sensor in the S1 may have a slightly lower Sports score than the A7 III, but as every photographer knows, there’s a doubling of the ISO values for every stop or 1 EV increase. This said, the difference between ISO 3730 vs. 3333 means that the Panasonic S1 is just –0.16 EV behind the Sony A7 III. As the table below shows, the 24MP Panasonic S1 sensor performance is ahead of its rival from Canon, the 30.3MP Canon EOS R, with the Panasonic delivering better results in all test areas. For a more detailed examination of sensor performance, we’ll compare the Panasonic Lumix DC-S1 to two of its closest mirrorless competitors, the Sony A7 III and the Canon EOS R.
Throughout the ISO range, the Panasonic S1’s color sensitivity more or less matches that of the Sony A7 III. At base ISO 100, the Panasonic achieves a marginally-higher maximum of 25.2 bits, and there’s a slightly higher value at both ISO 800 and ISO 1600. In the Sony’s favor, there’s some increase in color sensitivity at 51,200 and above, but the results are close enough to be considered identical, with the differences unlikely to be visible in images except perhaps at the highest ISO value. The Panasonic S1 has measurably better color sensitivity, and therefore technically has better color discrimination than the Canon EOS R, which is the latter sensor’s weakest area and may be noticeable in some images — for example, in areas of smooth gradations. All three cameras in this comparison perform well, most particularly the Panasonic and Sony, which just cross our 20-bit reference for good image quality when set to ISO 3200 (our current benchmark for this sensor size and resolution). The Canon sensor, although still a good performer, is around a stop behind, crossing the same 20-bit mark when set to ISO 1600. At ISO 25,600, all three congregate around our cut-off point for acceptable image quality (14 bits). With a measured dynamic range of 14.5 stops (EV) at base ISO 100, the Panasonic S1 sensor is one of the class leaders — just 0.15 EV lower than the Sony A7 III. Between ISO 800 and ISO 1600, though, the Panasonic S1 sensor has a wider dynamic range than even the class-leading Sony. At ISO 400, it’s just over two-thirds of a stop (0.83 EV) more, which is quite significant, although the Sony’s dynamic range is more consistent throughout its ISO range — at least till ISO 102,400, where it stays above our 6EV quality benchmark. By contrast, the Canon sensor doesn’t quite have the same wide dynamic range as the S1 except at ISO 200 to 400, before the latter’s previously-mentioned uplift at ISO 800. A wide dynamic range is useful when recording a wide range of tones in a single image, and typically that means there’s more latitude in adjusting exposure in post-processing or when the camera processes the data to produce a JPEG. With the exception of the top-most ISO values, where the Sony has the lowest noise levels in our SNR 18% graph shown below, the Panasonic and Sony share practically identical, class-leading results. With the new 24MP Lumix DC-S1, Panasonic has adopted a class-leading sensor for its venture into full-frame. The test results are practically identical to those of the sensor used in the highly-acclaimed Sony A7 III, and in some areas, such as dynamic range, the S1 is able to offer an advantage in the highly desirable ISO 800 to ISO 1600 range, not just at base ISO 100. It achieves all this while maintaining low noise levels (as we’ve also seen with the Nikon Z6 and the Sony), which demonstrates that 24MP full-frame CMOS BSI-type sensors offer a desirable balance between pixel count and sensor dynamics. When you combine a high-performing sensor with a proven AF system, built-in stabilization, 9 fps continuous shooting, and a relatively new lens mount backed by influential lens makers, you have a highly capable camera and the beginnings of a promising system that can pose a serious challenge to the top three camera makers. In this review, we have compared the Panasonic Lumix DC-S1 to its most relevant rivals from other brands. As usual, you can create your own comparisons and in-depth analyses using our interactive image sensor ranking tool.